I must be the last food blogger in Kuala Lumpur to talk about this wonderful place. Better late than never I reckon and just in the nick of time before 2010 comes to a close. It's weird how I often resist those good things in life. Call it a natural deprivation.....saving the best for the last. I've often heard about Rohani Jelani's legendary classes....from my sister who has had countless lessons here, my friend S who had raved to me about the place, and of course from the blogosphere that is sprinkled with loads of references of this oasis of calm nestled within the bustling city. Top on my list of places to do when I have free time, I've been slack in ticking this off but one weekend, I managed to navigate my way through the sleepy hollow of Kampung Sg Penchala to arrive at the doorstep of the huge metal gate leading to this culinary retreat. Later, I found out from one of the participants, this was a sought-after class - the once in the year BBQ Party, where it prepped you for the festive season. 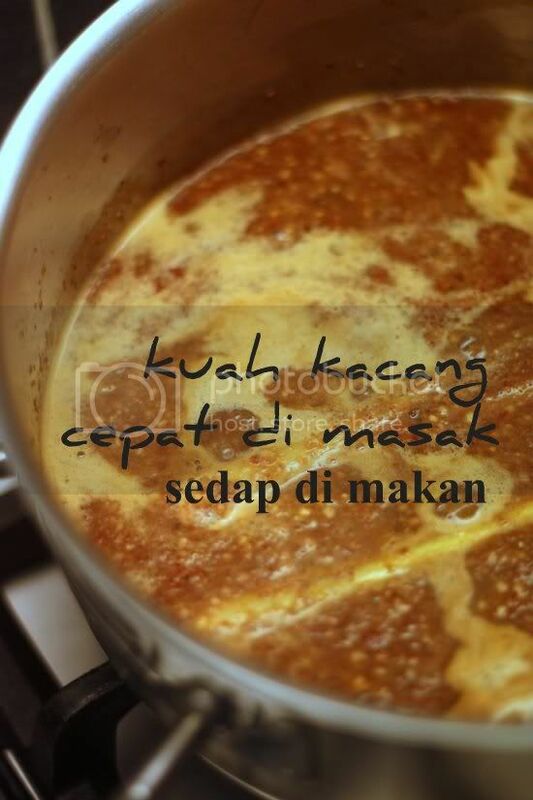 Learning how to cook at Bayan Indah is not only about techniques that any cooking school can drum out but a whole karmic experience since you meet new food-like-minded friends and you get your hands dirty by working your way through the recipes. 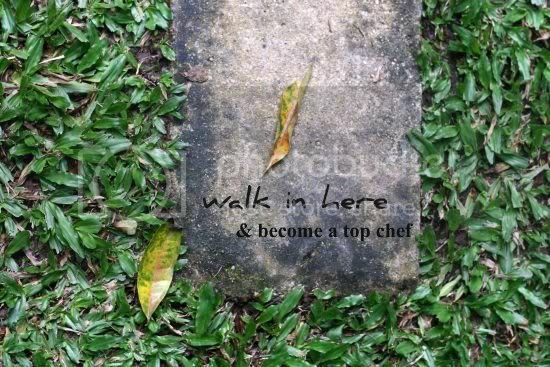 Add a wonderful tropical resort setting (where you can even spend a night in well appointed rooms) and an experienced Le Cordon Bleu trained teacher in the form of Rohani Jelani, and you'll have a formula for success. 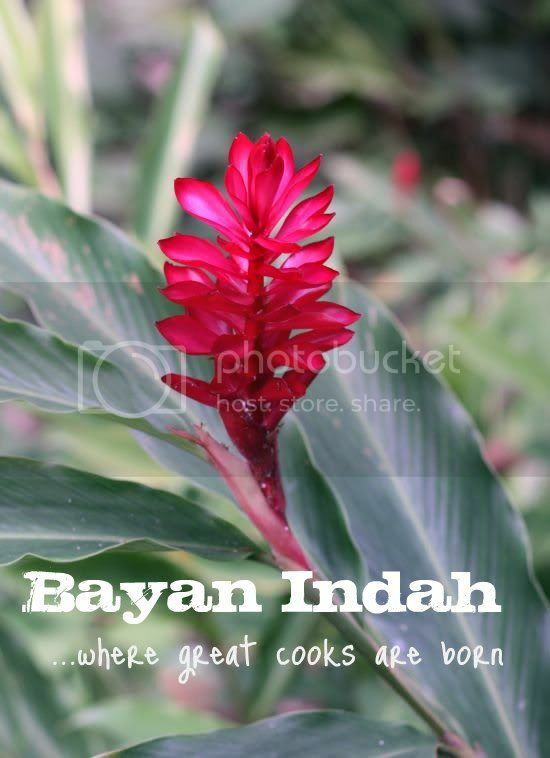 For me, Bayan Indah has a friendly vibe kinda like a hugging cousin's place where you step into to learn how to cook up and share a wonderful meal among friendly souls. Best of all, there's no need to wash up after all that cooking...the perfect dream come true! 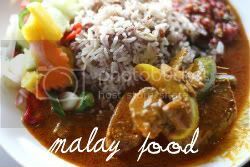 The very experienced Rohani has groomed many home chefs with her simple no-fail recipes and even taught a few celebrity ones about our Malaysian cuisine. Recently, she played host to Todd English who was here to film his television series Food Trip and Top Chef finalists, Ed Cotton and Angelo Sosa. She's also contributed to numerous publications. Our group was a motley bunch - a couple from Minnesota US and UK who were traveling around Asia, a mother and daughter team, two good friends, a first timer and a regular Bayan Indah attendee. There was even a familiar face in the form of food blogger Pure Glutton among the sea of strangers. It was a busy afternoon as we tied on our denim aprons and got down to the different dishes we were assigned to. 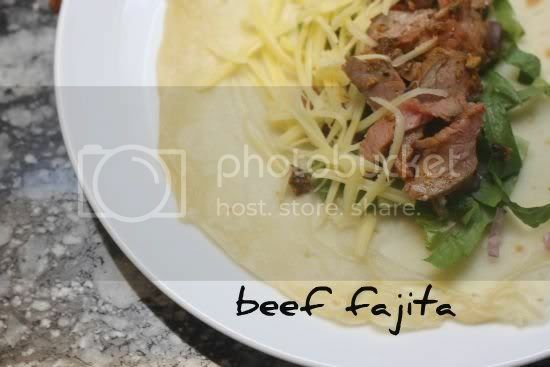 Split into groups of two people, we had to tackle dishes like the beef fajitas including making the tortillas from scratch, naan bread, tandoori chicken, beef and chicken satay including the peanut sauce, grilled prawns, grilled lamb, honey ginger chicken and salad. 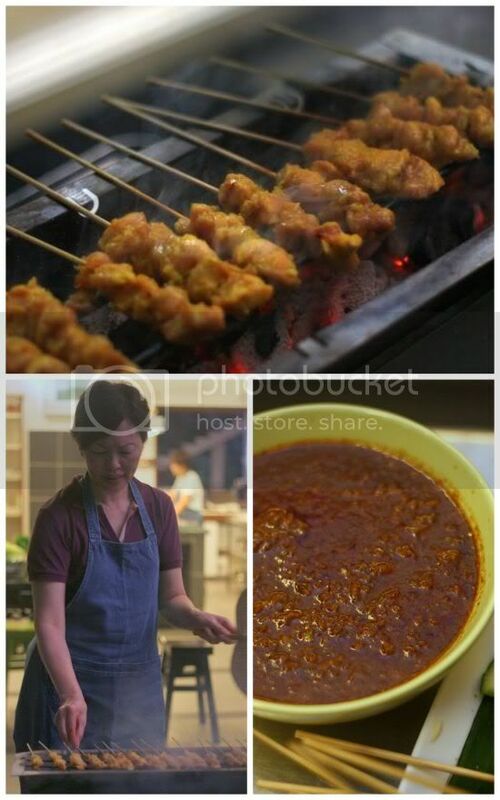 My biggest thrill was making the chicken satay and the peanut sauce, something I've never attempted before. Surprisingly, the peanut sauce turned out to be wonderful. We had a few worrying moments as we kept tasting it a few times before the peanuts softened. Eventually the spice paste's flavours emerged after a long stint of boiling. 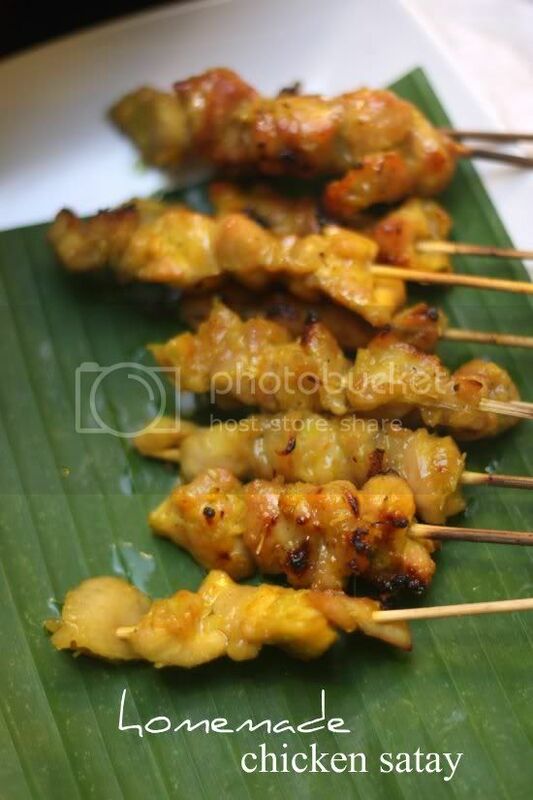 I thought the chicken satay was a goner since I had cut the chicken pieces too small. 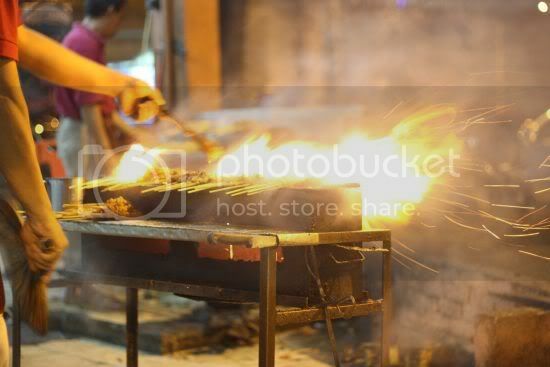 It did make piercing through the bamboo sticks a little hard but suprisingly, after grilling it on the hot coals, it turned out to be juicy and well marinated. Sinful pieces of chicken skin in between the meaty bits added to the succulence of the meat. Making naan from scratch was a little bit tricky but we managed even though not all of our naans were fluffy pillows of dough. 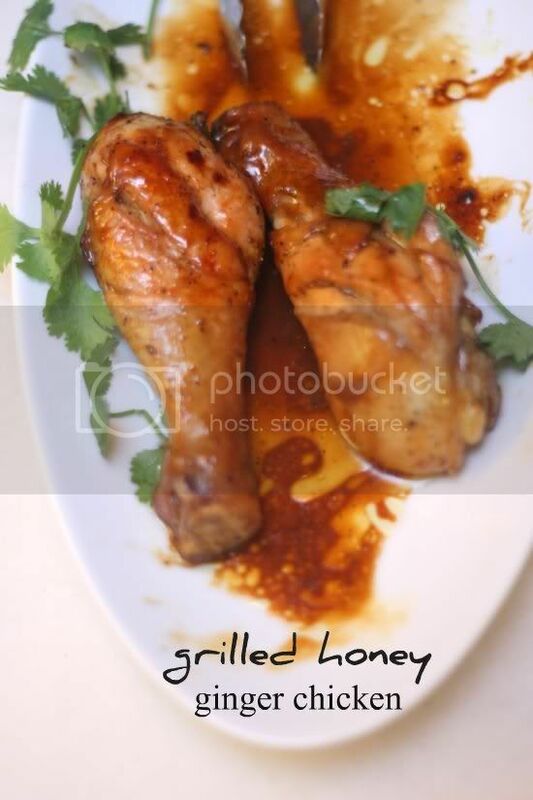 The tandoori chicken was a little watery since I kinda forgot to drain the marinade but otherwise, it tasted fine. Rohani will be around to give us pointers including how to work those dough balls magically into flat pieces of naan to be grilled on the flat iron griddle. She even shared her secret way of draining salad leaves minus the salad spinner - roll them in kitchen towels for the leaves to shed their moisture. Great idea that meant no need to purchase a bulky salad spinner. 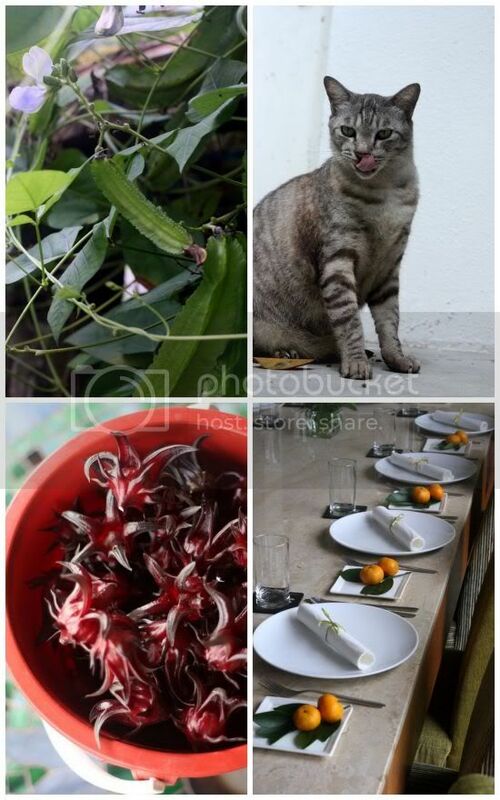 The whole place is also brimming with Malaysian exotica - herbs, vegetables and fruits - a perfect place to learn more about our home grown produce. After we finish our work, the sideboard is groaning with all our dishes, as we taste and try each other's food, sharing tips on what worked for us and what didn't. It's good feedback since these are the little pointers that make and break a recipe. Most importantly, we all had fun and managed to enjoy our fruits of labour. I reckon I've definitely caught the Bayan Indah fever....as we're scheduled to return in 2011 for more fun learning. 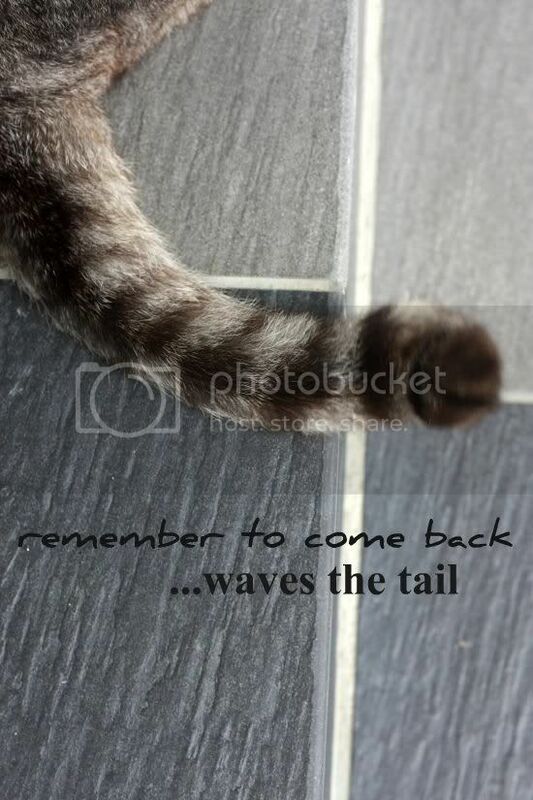 Hopefully as the tail of Linkin' the cat beckons to me like a wand, I'll keep to my New Year's resolution to keep coming back again and again..
Last weekend, I had a chance to join in the celebrations at the Welcome Community Home in Batu Arang, an after care home for those diagnosed with HIV. Run by the Catholic Welfare Services, I joined my friend HK who had tirelessly arranged for Christmas presents for the party for her church. Other homes around the Rawang area also joined the celebrations. Some occupants are Myanmar migrants with small kids in tow. What joy to see those happy faces when they got their cupcakes and cake pops (those cutesy fudgey cake balls on a stick). 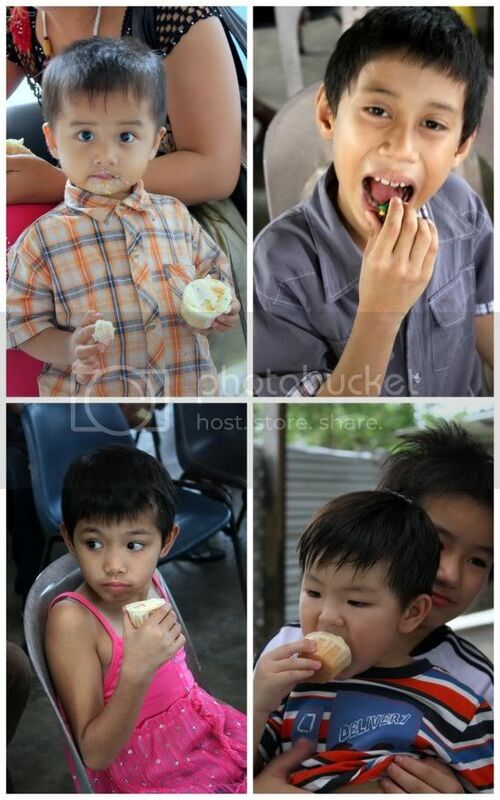 No matter how old they were, faces lit up with that sweet treat. A service was held before the festivities to give thanks followed by lunch. 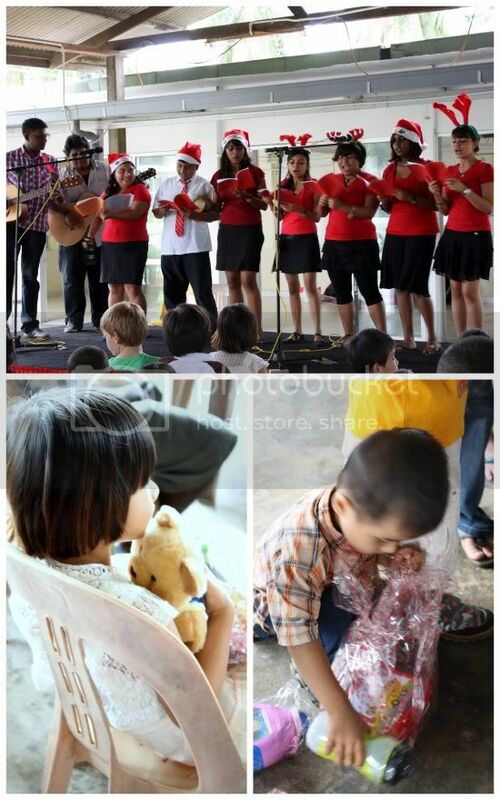 A young group from the church entertained everyone with their Christmas carols and happy music that got our feet tapping away. Everyone walked away with something and the kids were the happiest especially when the soft toys came out from a bag. Poignant moments indeed - a little Myanmar girl hugging and kissing her teddy bear tenderly - one HIV patient clutching on to his cake pop like its the most precious thing on earth. 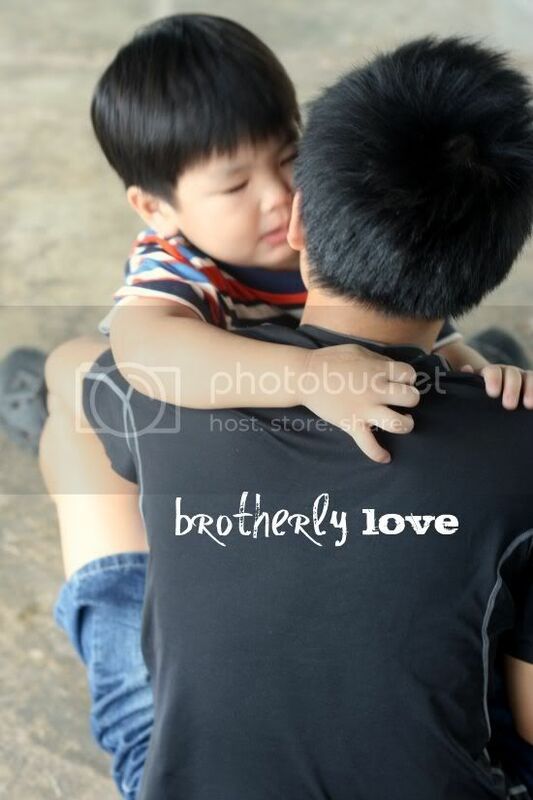 This Christmas, let us reach deep into our hearts and spread the love all around. 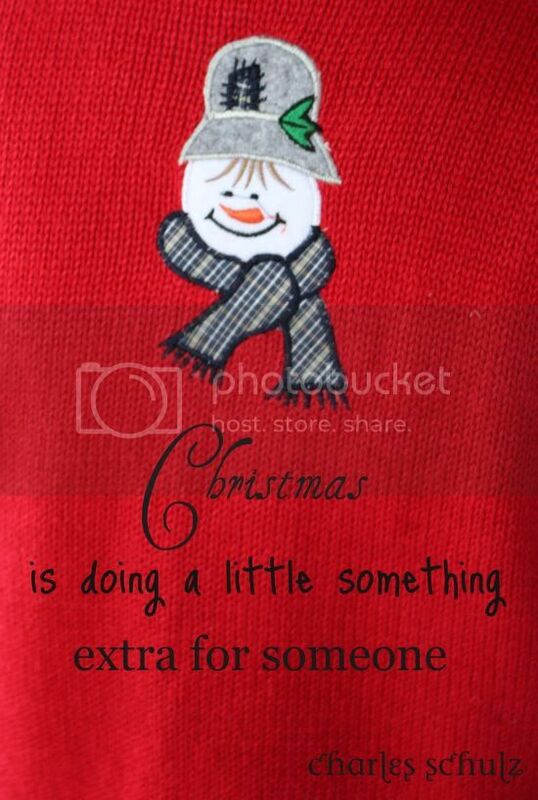 Just a small gesture of kindness to anyone will touch their heart. Merry Christmas & peace on earth. Fukuharu seems to be the perfect setting for that scene with my friends - a place they can get together -share stories (and maybe a teeny weeny bit of bitching, since we're no angels). 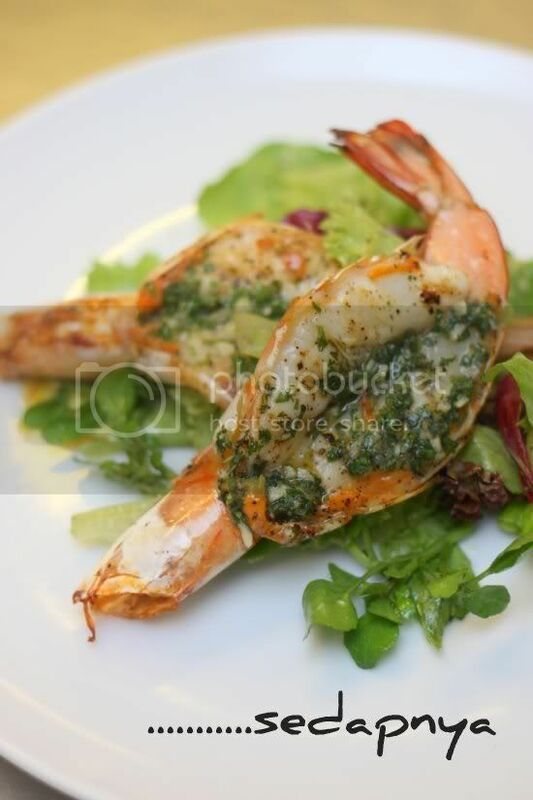 Food here is simple and unpretentious, while service is top-notch and immensely personalised. 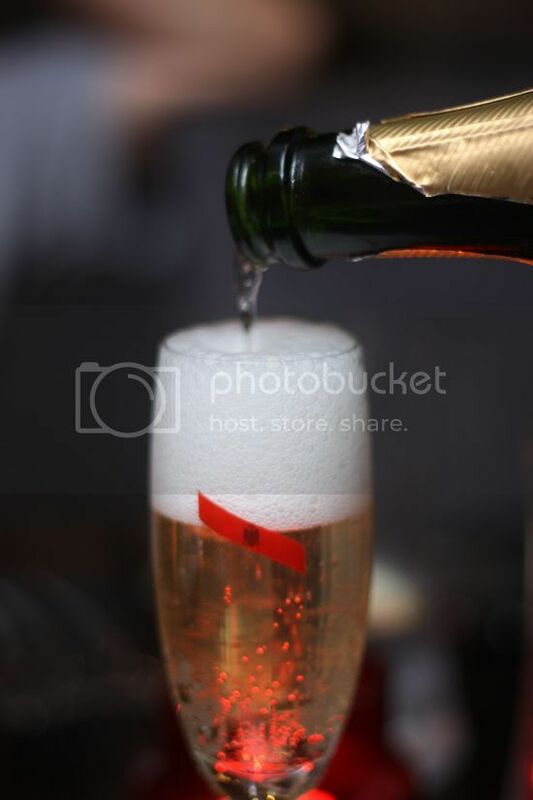 Recently crowned best Japanese in the 2010 Time Out Food Awards, the restaurant is garnering new found fame. The menu covers a gamut of familiar Japanese items like sushi, sashimi, makis (including temaki), agemono (deep fried items), teppanyaki, yakimono (grilled items) and nabemono (hotpot dishes). 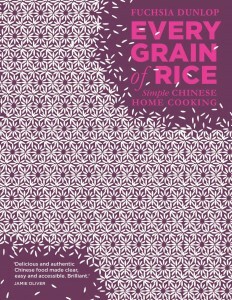 There are also rice and noodle dishes for carb lovers. If Japanese terms confuse you, just zoom in on the blackboard menu, which notes down new items, popular favourites and sets to get you started without you killing off your precious brain cells. A big must-have is their mentai sushi. Essentially a tamago (egg omelette) on perfectly formed sushi, what uplifts it to greatness is the layer of creamy cod roe (mentai) on top that is scorched with a blow torch. The combination of the creamy topping pairs well with the soft textures of the egg and rice. 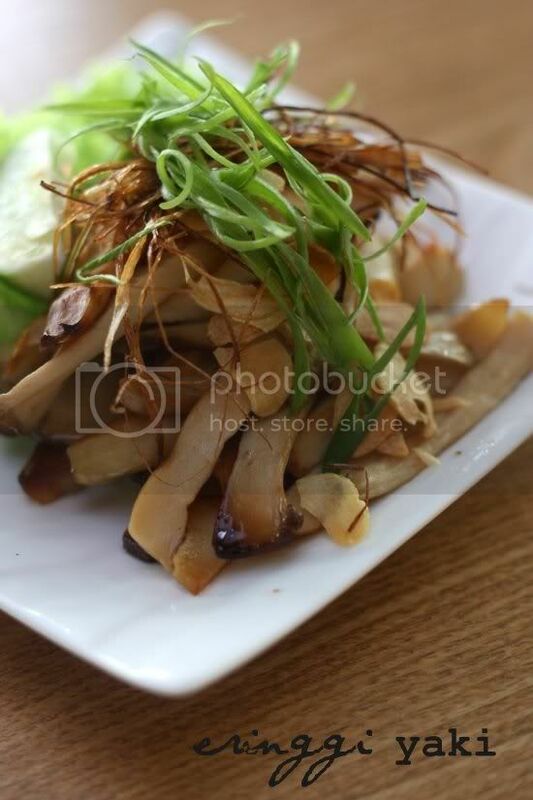 Another great favourite among all of us is the eringgi yaki (RM14), a simple but satisfying dish of aromatic grilled sliced eringgi mushrooms. 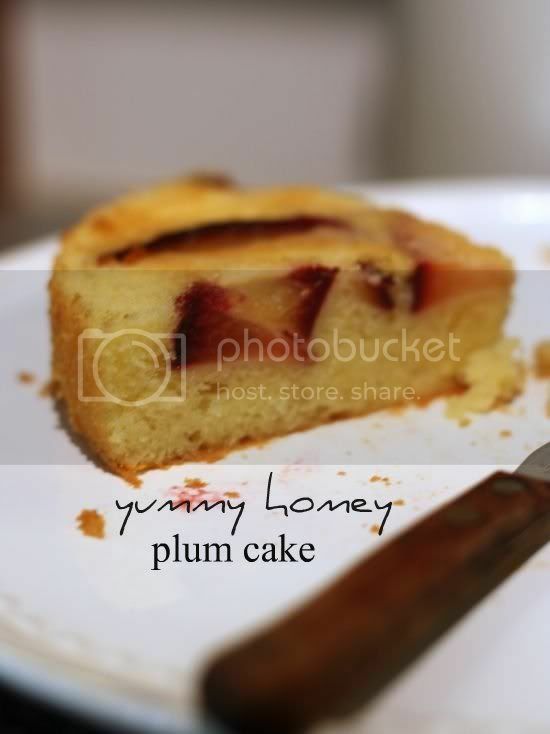 They are so addictively good, that a few friends have been looking to recreate the same dish at home. 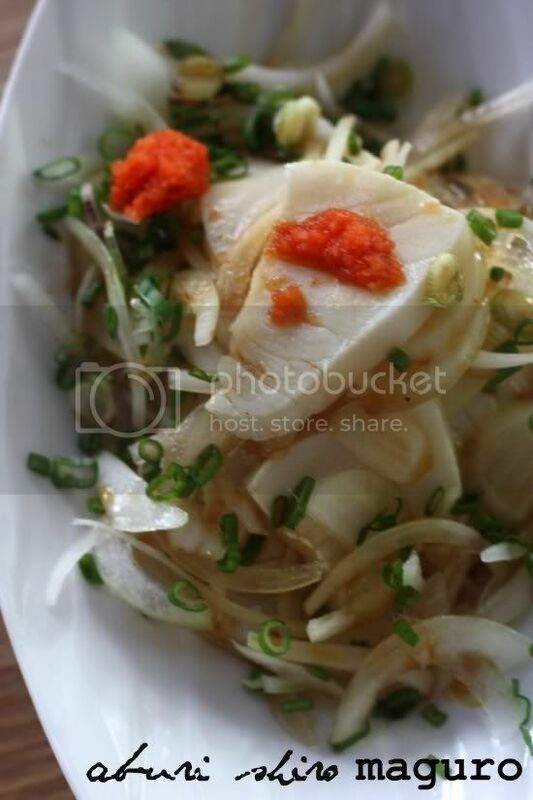 We also enjoy the aburi shiro maguro (RM32), pan seared butter fish tossed with crunchy onions and a ponzu dressing. The ponzu and spicy cod roe adds a tangy zing to the refreshing dish. Every visit seems to open up more favourites that have us returning again and again. Take for instance, the Tanuki Soba (RM15). Innocently nestled in uneven shaped bowls (I so wanted to steal one home but I did resist), the noodles looked a little plain and frankly quite ordinary. Mix all the ingredients to combine the flavours and slurp it down. You'll discover that the slight kick from the wasabi balances out the sweet taste of the sliced abura-age (deep fried tofu pouches) and the dipping sauce. 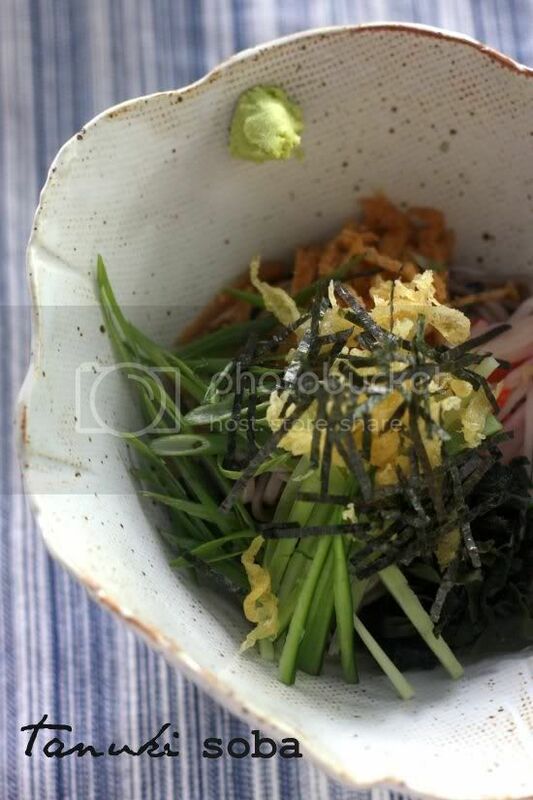 It is also a bowl of textures as deep fried tempura bits give crunch to the soft slippery soba strands. Julienned cucumber, crab sticks and nori sheets round up this wonderful yet simple dish that is now a clear favourite of all of us. 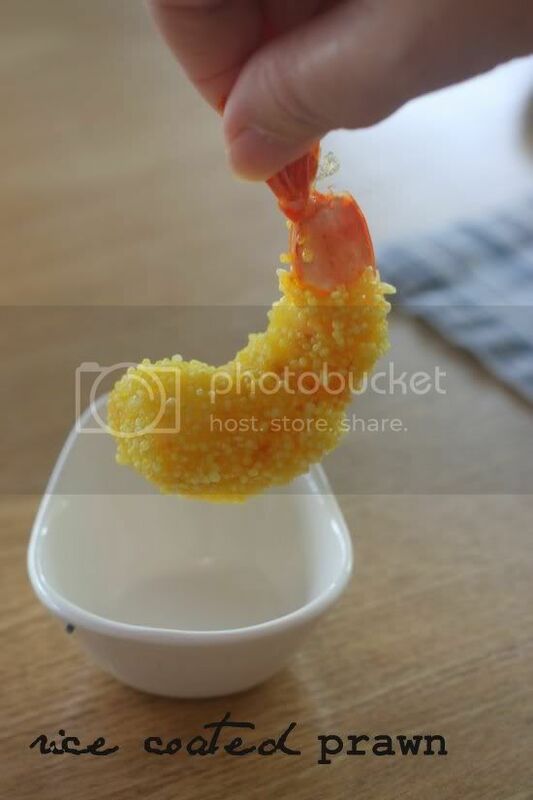 There's also a touch of unusual, in the rice coated prawns from a selection of mini kaiseki appetizers (RM35 for three persons) - rice granules that remind me of rice bubbles which coat the crunchy prawn that is deep fried. 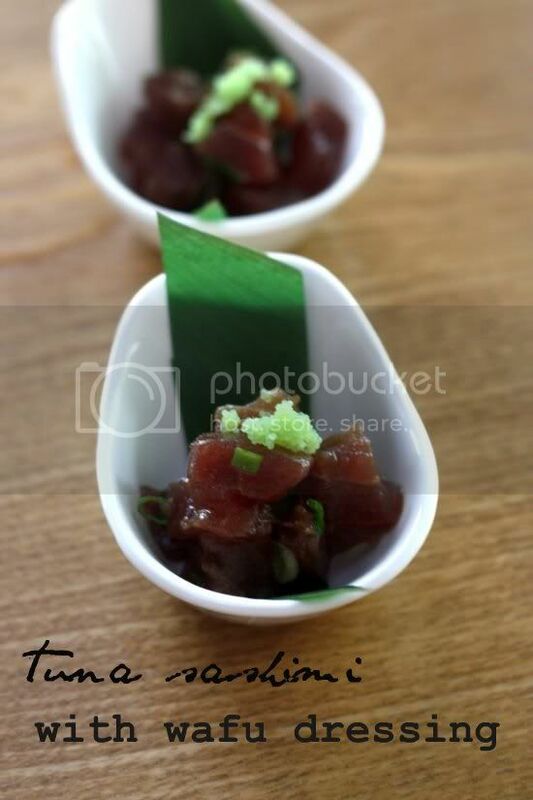 Also in the appetizer platter, the mentai sushi, tuna sashimi cubes tossed in wafu dressing and salmon balls. We also sample the salmon shioyaki (RM28), juicy grilled salmon with salt. 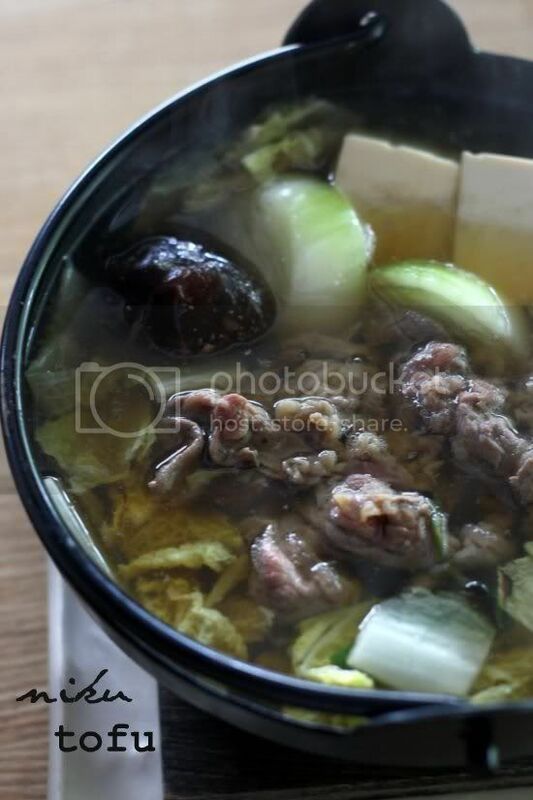 We end the meal with a bowl of comfort perfect for the soul - the niku tofu (RM26) a dashi broth laden with white cabbage, beef slices, onions, shiitake mushroom and silky soft tofu done sukiyaki style. 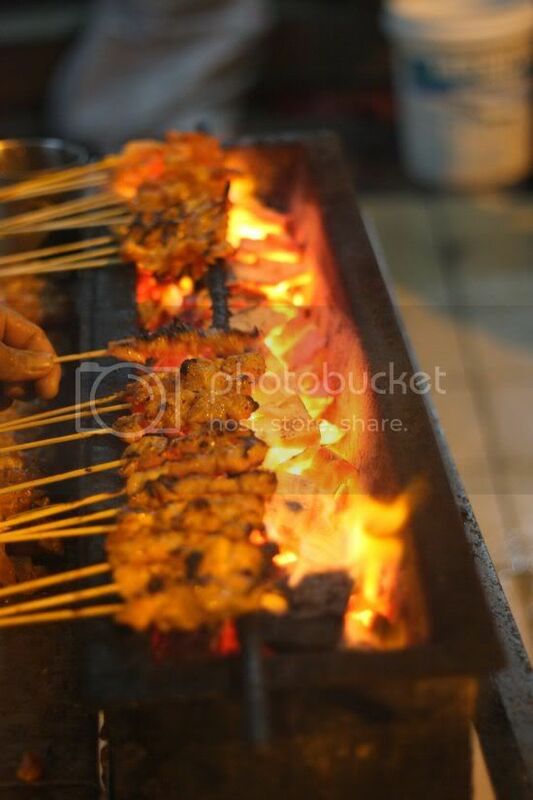 On a previous occasion, we had dined on tori yuzu shioyaki (RM30) - salt grilled chicken served with a yuzu paste. It is the same condiment that often appears in Sage/Cilantro since it works so well with meats like steak and chicken - a little like mustard but so even better since the flavours are a little more mellow. Another great dish we sampled before was the hotate kamameshi (RM36), the hearty tasting scallop clay pot rice topped with mountain vegetables. There's probably more to explore in the menu but in the meantime I'm perfectly happy with the selections I have tried. There's definitely a lot of heart put in the dishes here and prices are also kept reasonable to not pinch your pocket. Incidentally, the premises also houses an Illy Cafe, a perfect stop over for more conversations or just a caffeine jolt to get us going throughout the day. I'm so behind in my blog posts that it is so unbelievable. Motto of the moment - to clear the backlog before the year ends. Hope that holds true though, we'll see how things go. 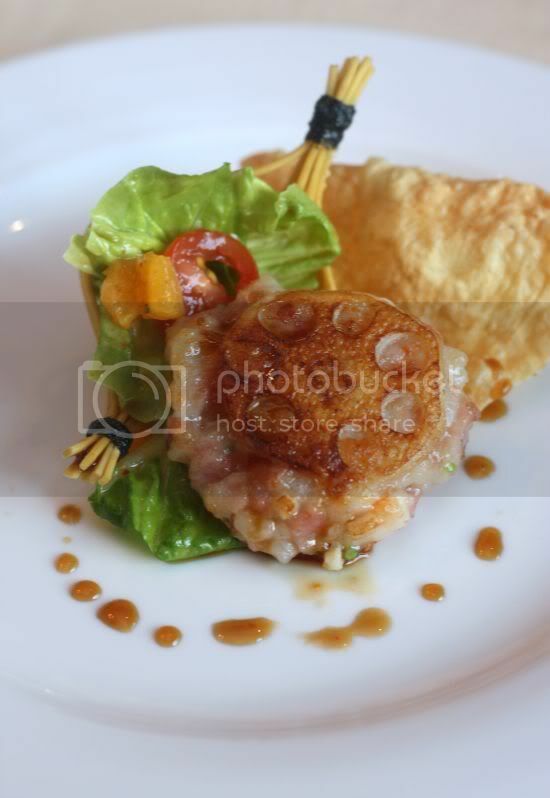 Millesime has been in the horizon for some time since Max Chin is a chef we have grown to love ever since we first dined at his small start-up place in Tengkat Tung Shin. Subsequently he moved to a larger space at Ihaus. Now, he has moved on to this place. One thing I've noticed about Max is the open kitchen is a big thing with him. Unlike the more closed kitchen structure of Ihaus, this place gives me tingles that remind me a little of the old Tengkat Tung Shin place since it boasts an open kitchen albeit a larger version. It's a nice comfy space - industrial chic cement look paired with red lit wine racks and the sizzle from the open kitchen to entertain you. We had dined here a few times - two full meals and the third one was just dessert, when we joined friends who were celebrating a birthday. After about a month plus, I reckon the kitchen is working well as even without Max, they were holding the fort down quite well. 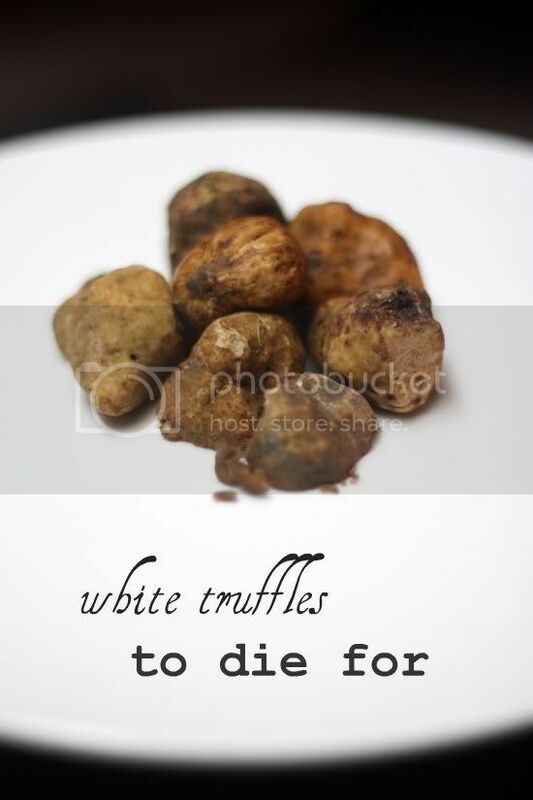 Rave reviews about the truffle menu have been peppering the blogosphere. Bolstered by friends who also had a fantastic meal there, we both decided to return specially on one of those rare occasions we are free to dine here.The white truffle menu is a choice of five appetizers for RM120++ whereby each dish has about 2 grams of freshly grated white truffle and a glass of GH Mumm champagne. 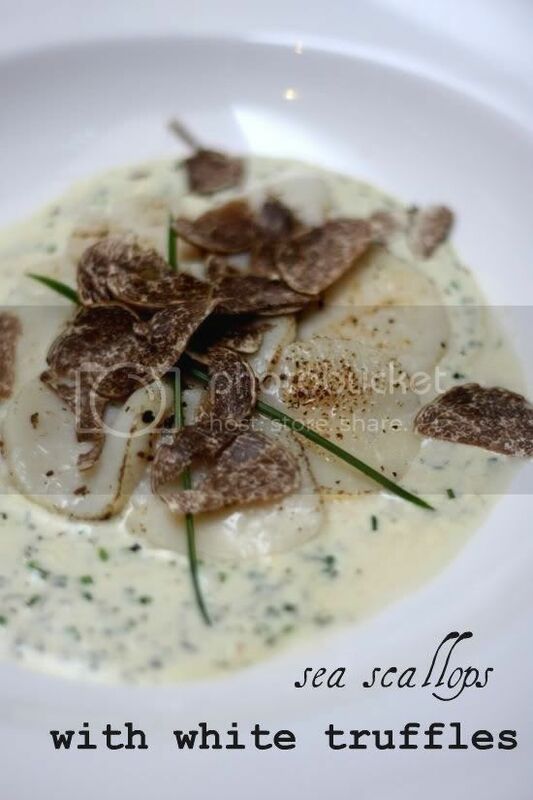 There's a choice of the classic truffle pairing with soft poached duck egg with white asparagus, duck breast, blow torched sea scallops, parmesan cheese penne pasta with goose liver terrine, carpaccio of American Kobe beef tenderloin and duck fat poached Canadian lobster tail. 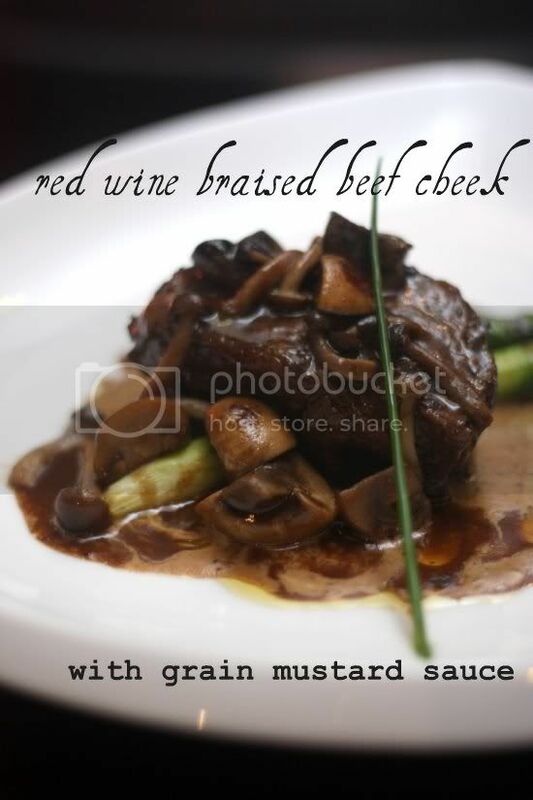 Degustation menu consists of 5 courses including a choice between two items for the main course. Changed on a daily basis, Max decides what's goes into the menu. It is very produce driven and dependent on what Max has managed to score in the market or import in from afar. We kick off with an amuse bouche, smoked marlin roll ups that seem to be fast becoming another of Max's favourite ingredients. 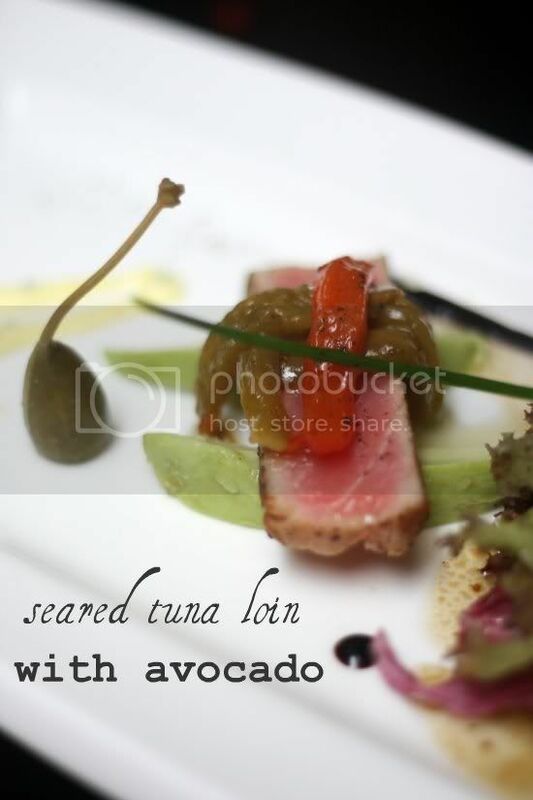 Regular diners will be able to recognise Max's signature style - the familiar tuna loin that appears in my appetizer, beautifully seared and paired with the soft avocado. There's also an octopus carpaccio with artichokes and a drizzle of Max's infamous reduced balsamic vinegar. 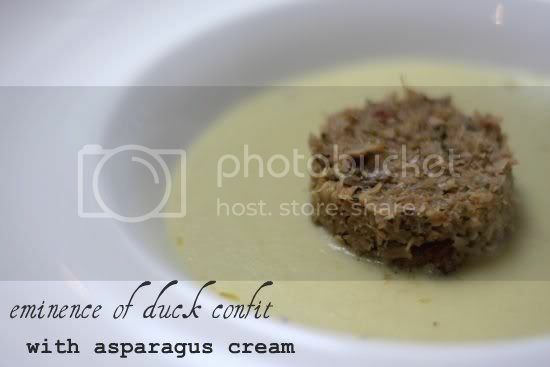 My favourite item for that night's dinner was the simple soup - an ethereal pairing of smooth and piping hot asparagus cream poured at the table that you mix with the shredded duck confit (one of the only ways to tackle our tougher local duck since we can't import in foreign fowl!). Spoon licking stuff that was crying out for a quick swipe of bread to wipe up the lovely creamy soup. Next came more decadence as our appetizers arrived from the truffle menu. 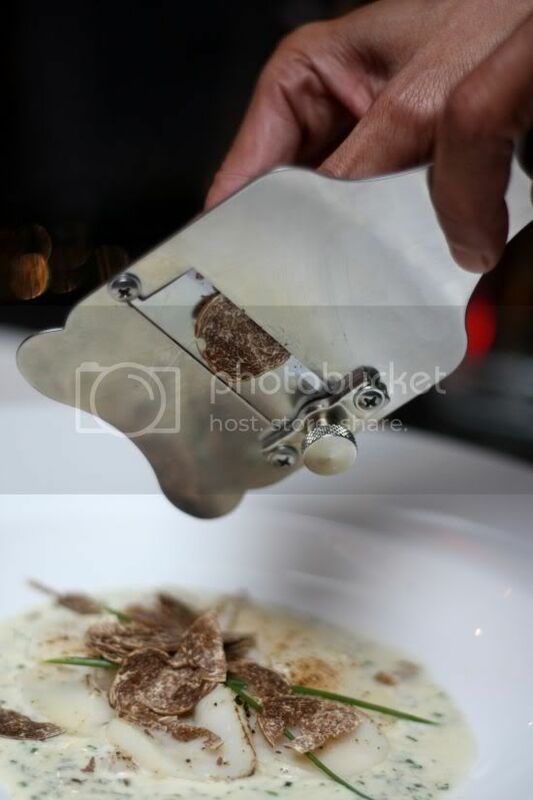 We had opted to switch one of our appetizers from the degustation menu with the truffle appetizers. I opted for the scallops and Splashie Boy obviously went for the Kobe beef. No words to describe those scallops but they are decadent, sublime, wonderfully sweet and perfectly cooked. Even without the truffles, it tasted heavenly with the creamy dill sauce but the truffles pushes it up the scale to even higher greatness. Equally fantastic was the kobe beef carpaccio with slivers of the fresh truffles. We had overestimated our tummy capacities as it there was our mains - a choice of the beef cheek or cod fish. While the braised beef cheek was divinely melt in the mouth, the cod did leave me a little dissapointed. It's strange but somehow I've had two issues with the cod fish here - just a tinge not as fresh as I like it to me. 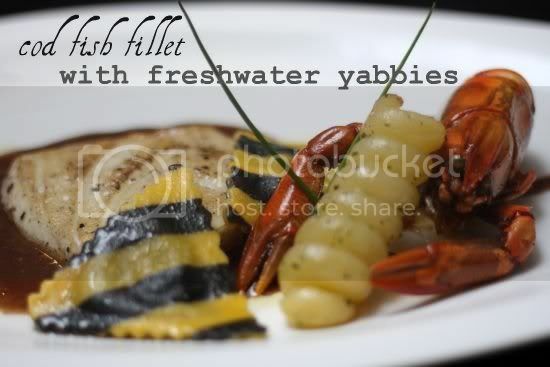 I did enjoy my strange dual coloured ravioli and the yabby that was hugging onto the potato for his dear life. 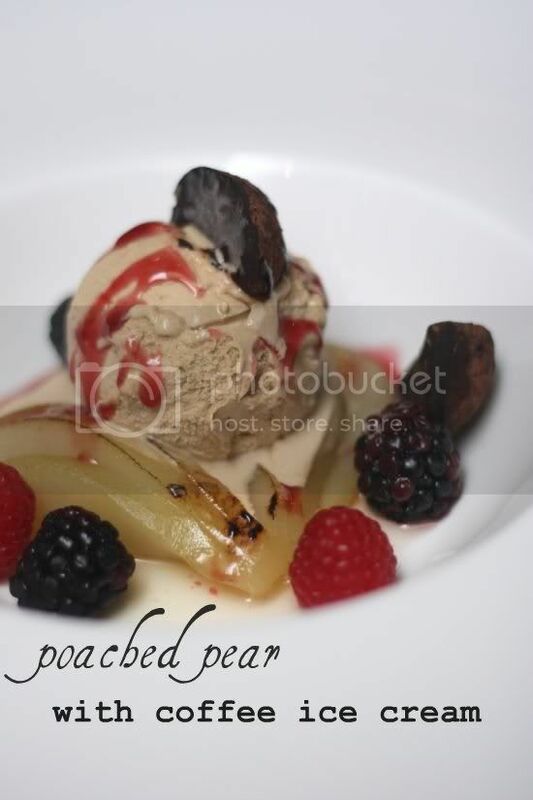 Dessert ended with a pretty ordinary poached pear with coffee ice cream. What made that simple sweet end was it was topped with these soft chocolate truffles. 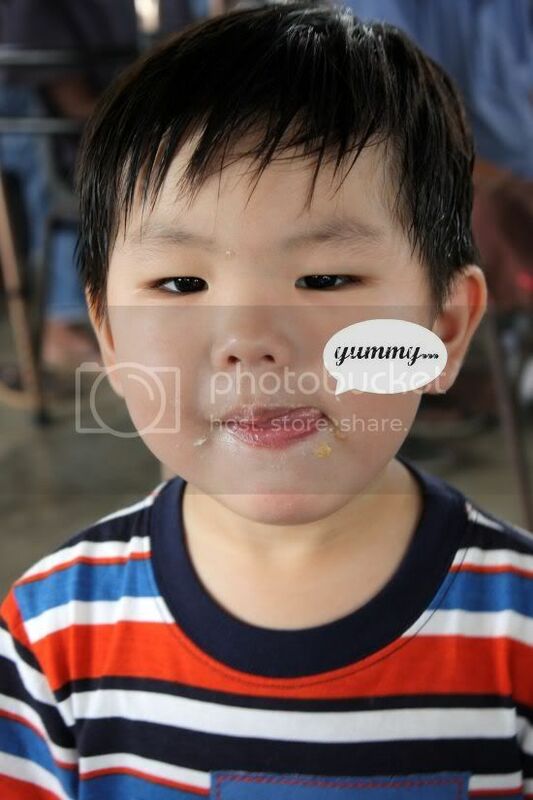 Generally we were rather happy with the food even though not everything was perfect like the seafood dish. The soup, scallops, beef cheek and Kobe beef carpaccio scored high points with both of us. It'll be nice to see how things unfurl at Millesime since their feet is now wet and ready to go. 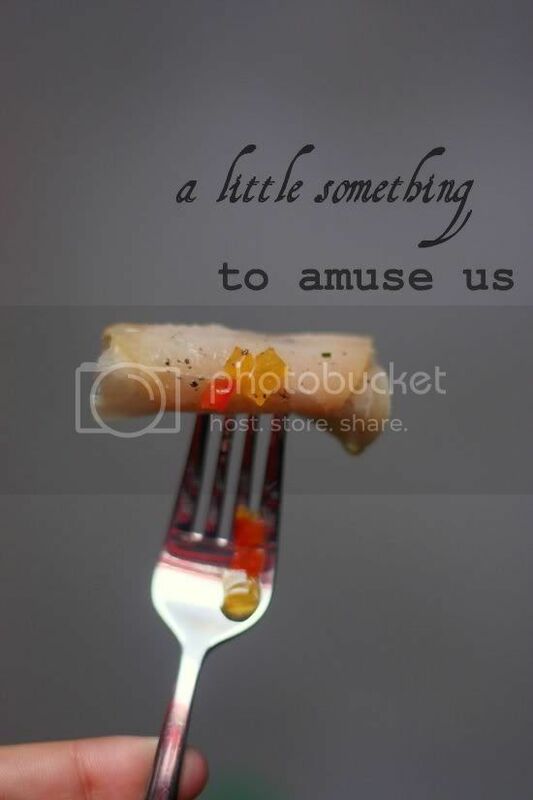 Hopefully we see more variety and unusual items coming up here as Max has always dazzled us with his culinary genuis. It is really weird but I've not blogged about this wonderful place till now....took me long enough as I realised my first visit to this place was around December 2008 (almost 2 years ago!). I call it the triple S - subconscious selfishness syndrome. The food at Elegant Inn always impresses me and judging from other rave reviews, I'm not the only one. It's not just all about the taste but the passion behind it all. 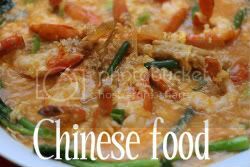 Throughout the years, Jeannette from Elegant Inn has become a good friend and the person I often reach out to demystify the mind boggling nuances of Chinese cuisine. She's very much involved in the restaurant with a passion and zest that most restauranteurs don't seem to possess even an ounce. 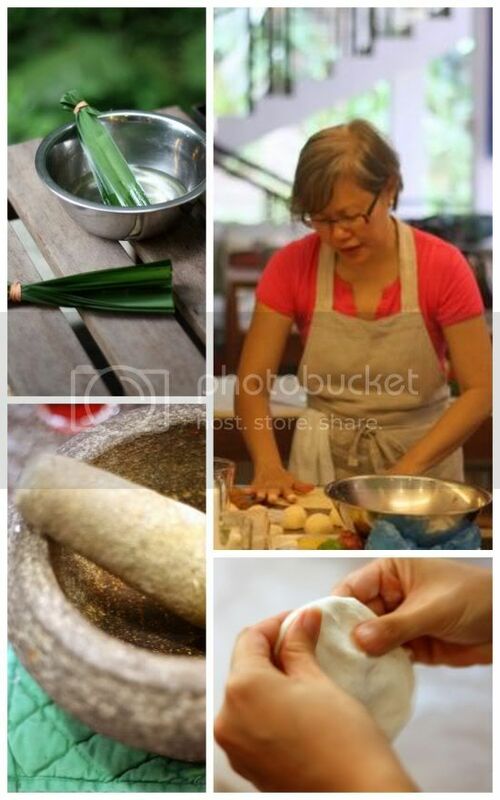 That passion drives her to emphasise on the best ingredients - fragrant Bentong ginger and tofu puffs - handpicked dried seafood from Hong Kong - artisan soy sauce from Hong Kong and the list continues. She's also not afraid to experiment especially since her palate has led her to many great restaurants, hence in one dish, there could be sous vide methods and even balsamic vinegar! 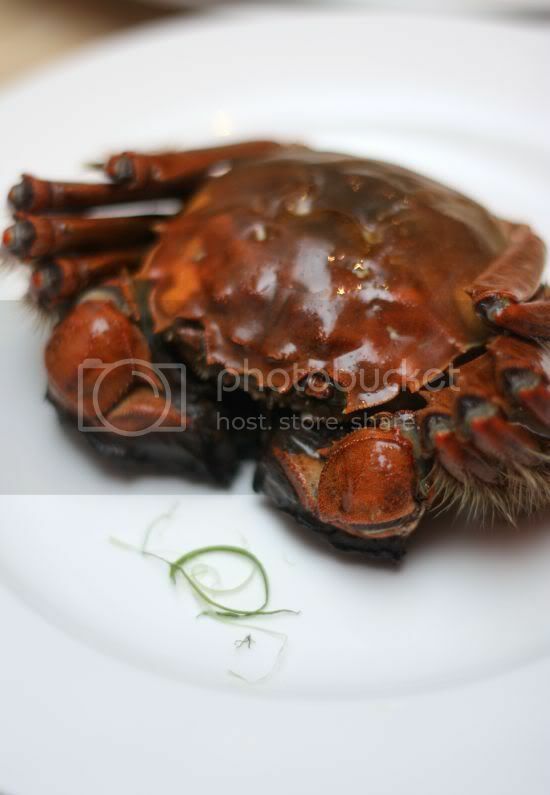 Back to the food and let us focus on their seasonal offerings that is available for these few weeks aka the Shanghainese Hairy Crabs - crustaceans that will give a hairy gorilla a run for their money. I'm a huge crab fan hence a yearly pilgrimage to the crab shrine to pay tribute to these sweet crustaceans with their luscious golden roe is a must. Simply decadent and artery clogging but luckily it was just what the doctor ordered since he was also partaking in the same delicacy as I was. Less of the guilt factor I reckon since it came medically approved! This year, Elegant Inn is promoting their six-course Hairy Crab set at RM118++ per person available in the next two weeks before the season ends. There is loads to line the tummy prior to the star of the show arriving. Nibble on the twin delight platter, artfully presented with a noodle basket that nestles the smoky prawn and lotus root cake. Don't miss out the crunchy and really addictive nachos on the side. Next is the hearty shark's cartilage chicken soup with shark's fin and bamboo pith. Then (drumroll please) comes the man of the moment aka the hairy crab which should be slowly savoured piece by piece one. Once you gulp down the ginger tea to alleviate your heatiness, you can move onto some healthy greens with a dash of Japanese oyster sauce. 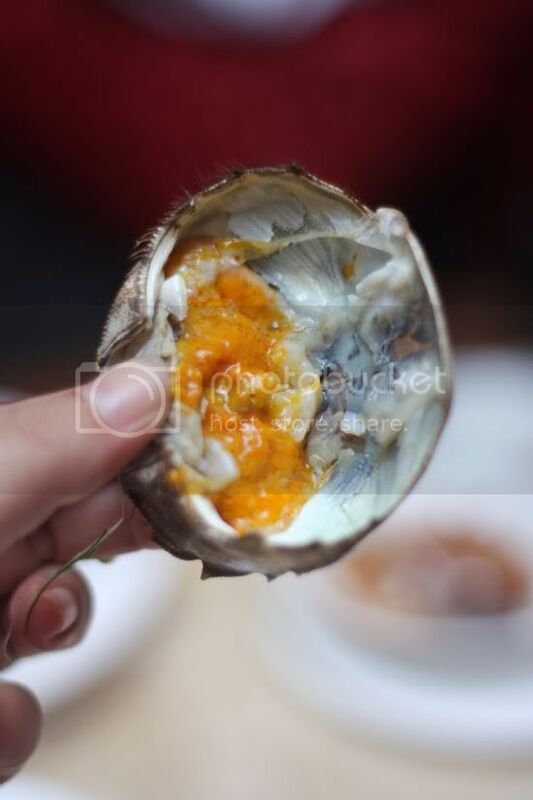 Next is the carbs in the form of a braised rice with fish and pearl clam in abalone sauce dishes beautifully presented in an abalone shell. 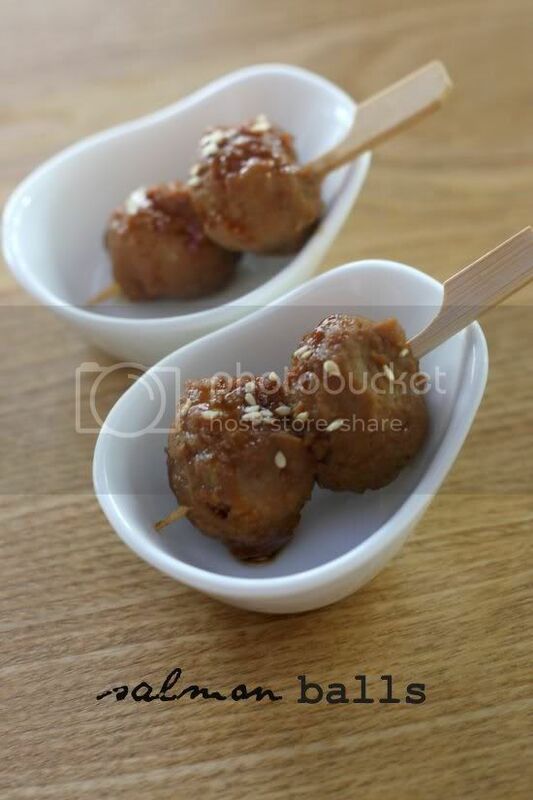 Round up your meal with dessert - crunchy nutty sesame ball with boiled ginger soup with white fungus and red dates. There's even fruits on the side to make the whole set way healthier than it sounds. 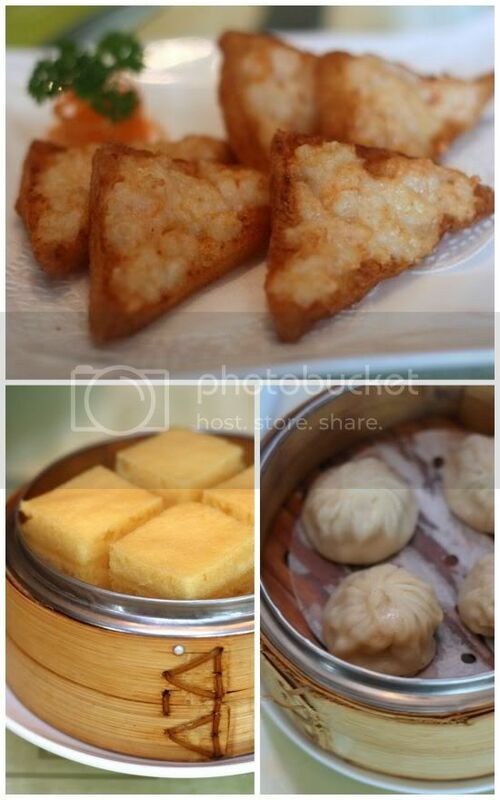 You don't get bored eating here since there's wonderful dim sum to touch your heart for lunch time. 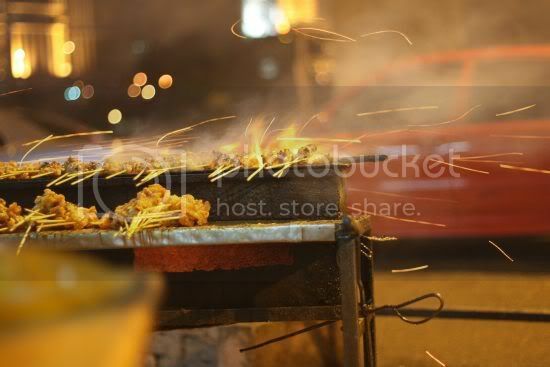 They boast about 44 varieties - steamed, baked, deep fried, snacks, special items and desserts. My favourite is the innovative crispy vegetarian rice roll - their version of the Hong Kong char leong. Instead of the fried dough cruller wrapped in the rice roll, the version uses a crunchy deep fried Vietnamese netting that hugs together shredded vegetables. 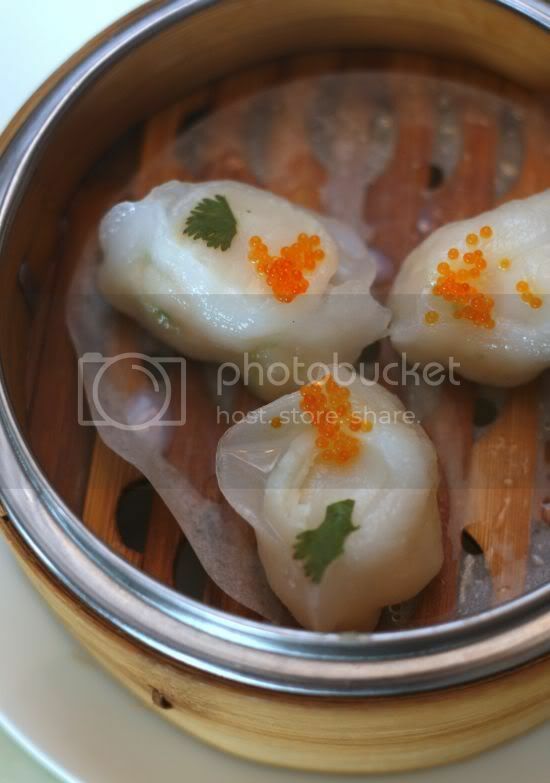 There's a long list of other must-haves from fluffy char siu buns, homemade taste fish balls, fluffy egg tartlets, steamed scallop dumplings and etc. 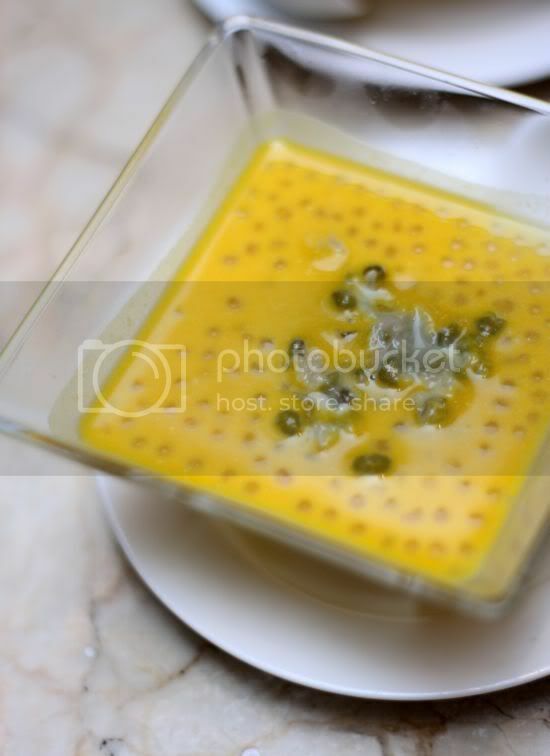 Those with a penchant for sweets will also love the pillow soft steamed custard cake, the refreshingly icy longan sea coconut, black sesame and glutinous rice ball in boiling hot ginger soup (a personal fav). On another occasion, we order the chicken with prawn paste - an old school dish given a new fangled twist. Similar to one eaten in Sek Yuen (theirs is fish paste), this is the deluxe version with bouncy prawns handchopped into a paste that is adhered to crispy roast chicken skin. 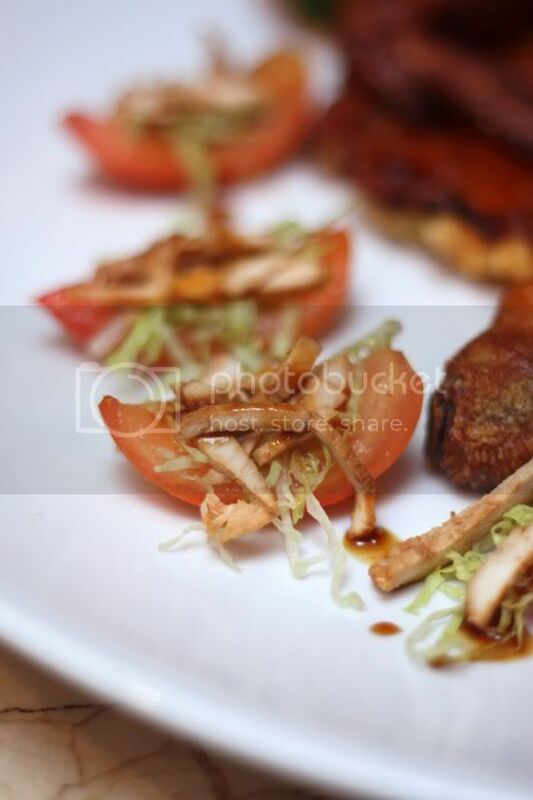 I especially love the side bits - tomatoes topped with the shredded chicken drizzled with reduced balsamic vinegar. Another new dessert we sample is the Japanese pumpkin tong sui with green beans - refreshing and not cloyingly sweet to end another supremely satisfying meal here. Next meal here I reckon must be their must-have aka the seasonal lap mei fan (waxed meats rice) that is probably the best rendition of the Chinese New Year dish in town. *Note: Part of the meals were paid by me while others were by invitation from Elegant Inn. Ah, the last month of the year is finally here...welcome December!! I'm sure everyone has been waiting for it since it signifies parties, parties and more parties to celebrate the year end. I was fortunate enough to get a head start on the partying as good friends, M & G hosted dinner at their place recently. The star of the show was a hefty 3kg Berkshire pork roasted to golden perfection. Flown in specially by their friend Mitch from Toronto, this was definitely the ultimate feast for porky fans. Roasted perfectly by the host, the organic pork melts in your mouth with a sweet taste. 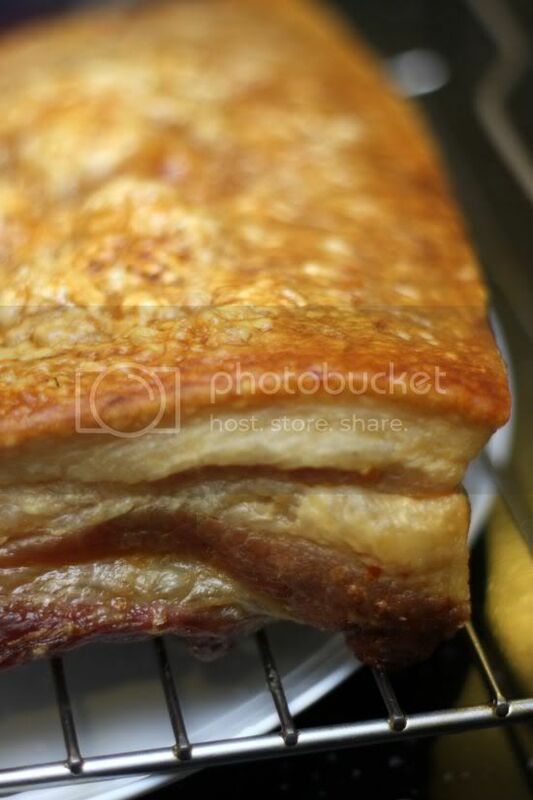 Leave the best for the last as the crackling is crunchy and to-die-for. Gorgeous just eaten on its own or drizzled with apple sauce, I reckon they have set the bar for the best ever roast pork I've tasted. 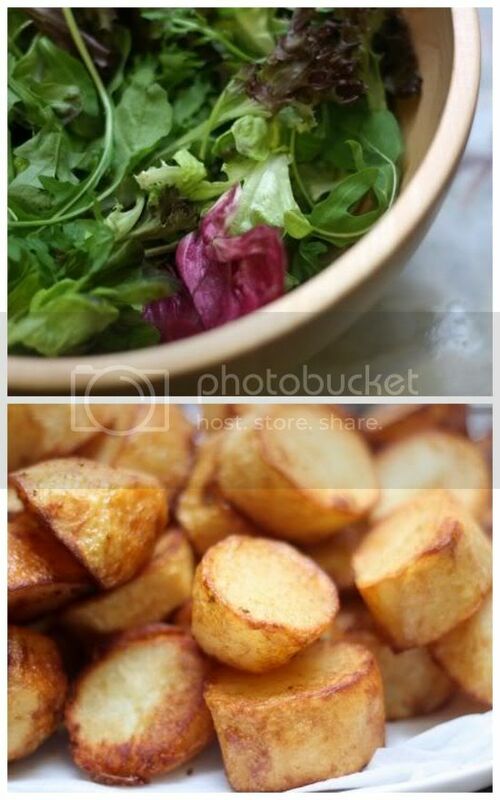 Don't worry, we did manage to eat other things too, fluffy potatoes for a little carbo and of course, salad leaves to alleviate the oil. Prior to the grand dish arriving, we tucked in to wonderful aromatic thick mushroom soup made with dried porcini, dried trumpets, button and portobello mushrooms. 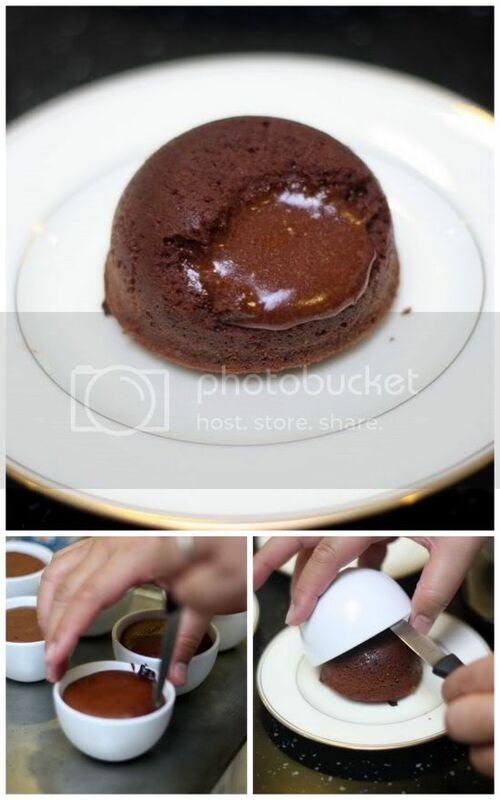 Dinner parties always must end with a dazzling showpiece and the hosts outdid themselves with their superb Valrhona chocolate volcanoes. 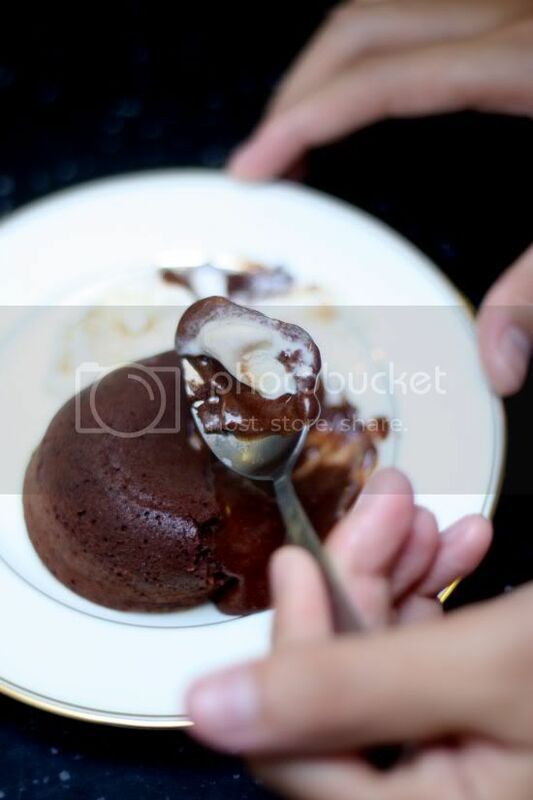 Made purely from Valrhona Manjari 64% chocolate, it was chocolate heaven when we dug into to oozing chocolate sauce with Haagen Daz vanilla ice cream. Thanks to hosts M & G, it was a wonderful dinner. 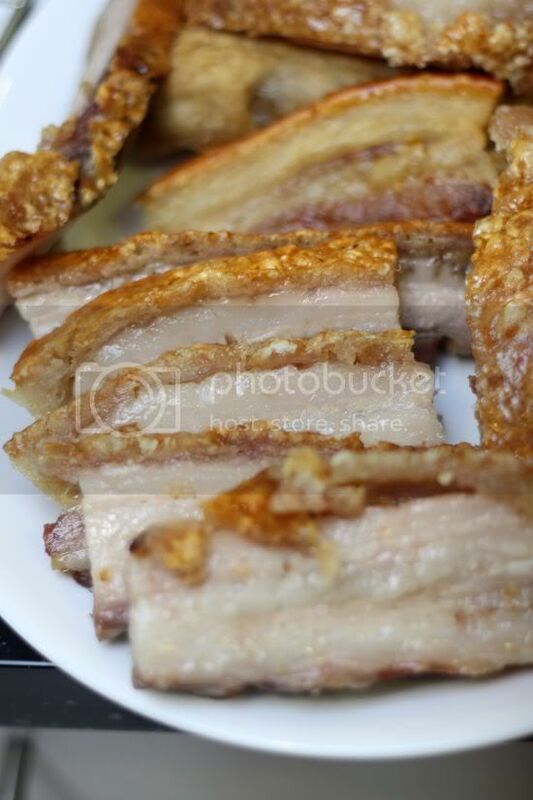 Am honoured you asked me to share with you a little of that precious Berkshire pork. So nice to meet Mitch and hopefully he's going to start making quarterly trips to Malaysia together with precious cargo like this. More pictures can be found in the Flickr set. So what's your party plans for the festive season? Homecooked meals to celebrate the occasion or drinking marathons at every club in town? Or are some of you taking that customary holiday break and flying off to somewhere wonderful to celebrate the end of 2010? Do share your stories as we kick off one whole month of celebrations and recover in January 2011 before another party starts in February with Chinese New Year.